GMHC fund raising event "Savor"
The GMHC is a non-profit organization that works on public policy issues such as prevention and care for HIV/AIDS. I was lucky enough to be Mike's date at a table that his firm bought for the night. The event was billed as a "foodie"night, featuring Ted Allen as the host, and four famous NYC chefs who were responsible for each of the 4 courses served. 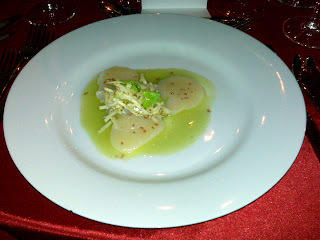 First course by Anita Lo (Annisa): Ceviche of sea scallops with celery and green apple - I think this was a typo. It was julienned celery root in the middle, and decorated with a couple of celery leaves. Overall it was not very flavorful. There wasn't much of the sour and sweet and salty contrasts I was expecting. The scallops were barely ceviche because it was pretty much raw. It was also over-salted with this brown sea salt. I have to say, we were also disappointed by the restaurant Annisa's tasting menu a couple of years ago. I've also heard gripes about her other ventures (Rickshaw, The Dumpling Truck). What's up Anita?? I was so impressed when you were on the Martha Stewart show! Get your act together! Second course by Anne Burrell (host of Secrets of a Restaurant Chef) - Duck confit with Asian pear and Belgian endive - This was pretty good. But who can really mess up duck confit. A smart choice as well -- this can be cooked days ahead (compared to any ceviche which has to be timed very precisely). 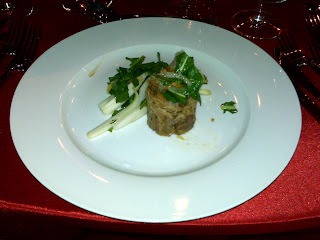 The confit was moist, rich in duckily ducky fat, and benefited from additional sweetness of slivers of Asian pear. It paired well with the bitter greens Belgian endive and (I think) arugula. 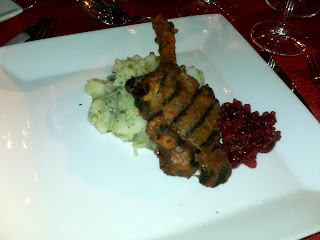 Third course by Suvir Saran (Devi): Venison chops with warm potato salad with mustard-oil, cilantro and onions - the venison chop was fairly well cooked. but it was quite heavily spiced that I was overwhelmed by the hotness. The cilantro didn't come out very well in the potatoes. It was overall a little blah. Fourth course by Pichet Ong (P*Ong): Chevre cheesecake, huckleberry walnut cookie crumbs - this was my favorite of the night. Pichet Ong sort of got his fame when he was with Jean Georges. With his new restaurant, he was said to be experimenting with the combination of savory and sweet components to great success. 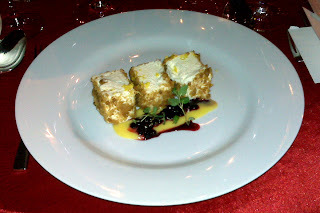 This was quite a lovely dessert -- I definitely wouldn't have thought of using goat cheese in a cheesecake. But it had such a lovely texture -- creamy but fluffy at the same time! The slight hint of savoriness in the goat cheese and a little salt from the walnut cookie crumb made the whole dish very interesting. If I had to pick on it, I thought the portion was rather too large. A rectangular narrow plate with just two pieces would have been pretty-looking and just the right amount. God I hope my firm didn't buy a table at this event. I'd be appalled if they did because they shouldn't be stealthily laying off people and at the same time paying for gay lawyers and their spouses to eat Anita Lo's overpriced food and laugh at Ted Allen's unfunny jokes! Btw, that was meant to be tongue-in-cheek ;) Agreed on the dessert -- it looked heavy, and that was a lot cheese for one course! Hmm I don't think I saw your firm's name on the program. But there is a fashion event coming up benefiting both GMHC and the Lambda Legal. So that will be more likely be sponsored by more law firms.